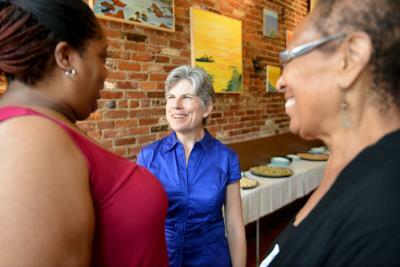 Friends and supporters gathered at the Atomic Bean Cafe on Wednesday, June 26th to join Kathleen in Kicking-off her campaign for Cambridge School Committee. Renae Gray, School Committee Member Marc McGovern, State Representative Marjorie Decker, and City Councilor Denise Simmons introduced Kathleen, who gave an impassioned speech about why she is running for School Committee. Kathleen brings an unusual combination of education and experience, having both an MBA and an MSW. Her financial, analytic and evaluation skills will be assets to the School Committee in its work to determine and implement education policy in relation to the CPS budget. Kathleen’s background in social work gives her a professional understanding of and insight into the challenges families and students face, and what can be done to support all students as they work to achieve their potential. As a member of the School Committee, Kathleen plans to focus on three core values: equity, access, and excellence. Equity is critical for all students to receive an education that leads to academic success, as well as successful and civically engaged adult lives. Access to the wealth of our educational resources and opportunities must be available to all students and families. Excellence requires us to provide the resources necessary to address the breadth of strengths and challenges our students bring to the classroom. Additionally, all students should experience high expectations from their teachers and through this experience learn to set high expectations for themselves. Kathleen understands that the School Committee is ultimately responsible for using policies that reflect the social justice mission citizens have valued in the Cambridge Public Schools to address the challenges so many of our families and students face. Kathleen served on the King Open School Council and the King Open Extended Day Advisory Council. She earned an MBA from Simmons and an MSW from Boston College. As a social worker and activist, she has worked to create greater access to educational resources and opportunities for all children, mitigate the social and emotional effects of violence on youth, families, and neighborhoods, and engage parents with different experiences and backgrounds in public school activism. As a small business consultant, she worked with immigrants and women who created successful businesses. In 2012, she served as the Citywide Canvass Coordinator for the Elizabeth Warren campaign in Cambridge and is currently co-chair of the Ward 6 Democratic Committee. A resident of Mid-Cambridge for over 20 years, Kathleen lives on Marie Avenue with her husband, Brian Corr, and son, Liam, a CRLS freshman.